Forgive my inclination towards abstract designs. I find them very versatile and classy. Inspiration comes easier when it is the idea. 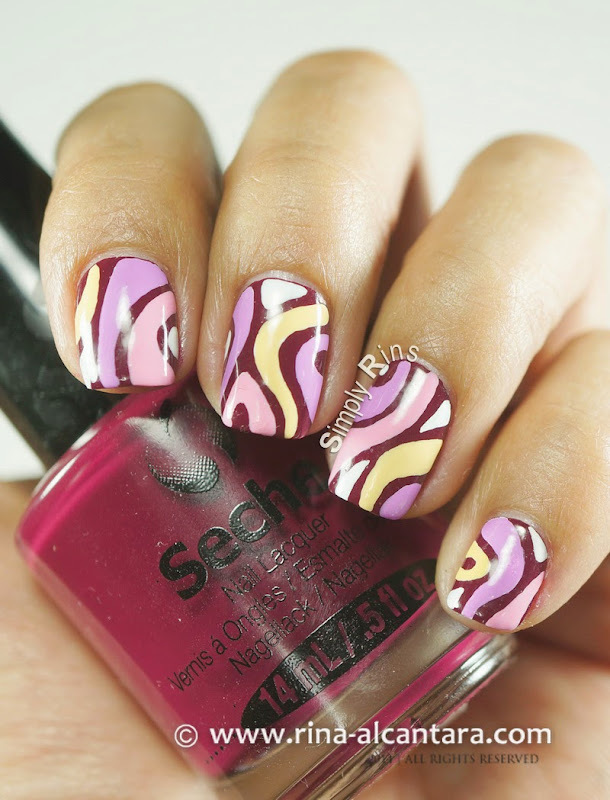 And so, lo and behold, here's another abstract nail art design. I didn't have any particular pattern in mind. I decided to be spontaneous and see what my nail art brush will create. The overall look was satisfying, to me at least. I called this Disaligned because that's the first word that came to mind when I looked at the results. Beats me now why I named this such. Oh well, unto the design! Does it look chaotic to you at first glance? May I say that it is chaotically beautiful, because I really think it is! It also looks quite attractive even from a distance. Perhaps because of its colors and the fact that the lines don't have direction. I did this nail art after a day of enjoying a manicure. I used 2 coats of Seche Vite Irresistable. Unfortunately the design didn't do this pretty vampy polish justice because I covered it with the design. But I would like to say that I absolutely love this nail polish. Consistency was just right and application was very manageable. And just like how we all know Seche Vite, the polish dries really fast. I only have 3 colors from Seche Vite and one left untried. So far, hasn't disappointed me. Would definitely like to get more colors. This is a freehand nail design, for which I used acrylic paints and a detailing nail art brush. Since my base polish is on the darker side, I hand-painted the lines with white paint first so that the colors would pop from the background. Based on my experience, if I hadn't laid white first, I would be painting each color layer after layer until I am satisfied with the opacity. I decided to use 3 pastel colors -- light pink, lavander, and light yellow. I also retained some white patches. I was thinking of adding a very light minty green, but clearly I didn't. I wasn't sure if the combination with work and I didn't want to overdo the colors. If there's one thing I really like about this abstract nail art, it is that it makes my nails look longer. Do you think so, too? Perhaps it's because of the curve lines or probably because of the vertical orientation of the design itself. I hope my Disaligned nail design will give you inspiration for your next DIY nail art painting. Let me know if this design appeals to you or not. What color combination would you use if ever? I think I would do it with green shades - because it's my fave :p But I'm pretty sure I wouldn't be able to pull this look off - I don't think I could do the lines properly..